I came up with this recipe one day, when I came home from a long day of babysitting. I just wanted to have something quick and easy to make for dinner. I knew I had a can of Prime stakes and some packages of gravy that I bought earlier that week. 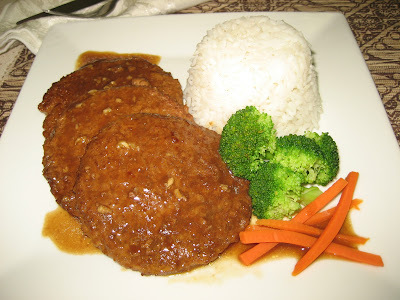 Just then I decided to make vegetarian prime stakes with gravy, steamed vegetables and rice on the side. 2. Gravy. In a saucepan, whisk 2 cups of water, brown and savory herb gravy mix together. Stirring frequently, bring to a boil over medium high heat.Simmer 1 minutes. Set aside. 3. Steam the broccoli and carrots for 5-7 minutes, or until tender but crisp. Set aside. 4. While the broccoli is cooking, arrange the swiss stakes in a nonstick skillet over medium heat. Pour gravy over it and simmer for 5 minutes or until swiss stakes is heated through. 5. Serve with rice and steamed broccoli and carrots. Tips: Sprinkle salt on the vegetables when you are steaming them, this will bring out their flavor.